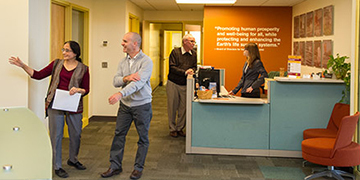 From top-notch meeting and event facilities, to private office space, to a contemporary lounge with really good fair trade coffee, the ASU Wrigley Institute has everything you want in a great collaborative space. If you need help setting up a videoconference, running your presentation, working with collaborators on-site or remotely–whatever your platform, we have the know-how to make your meetings shine. Collaboration results in creative outcomes, but sometimes it’s hard to get everyone together at the same time. 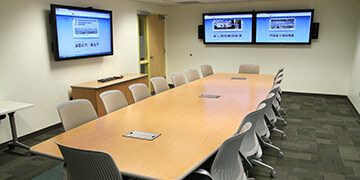 Focus on your work, and let the Sustainability Scientists & Scholars concierge help schedule your next meeting. 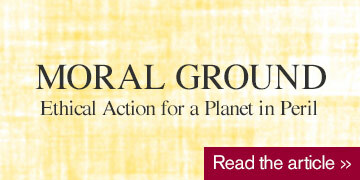 In an article titled “Sustainability as a Founding Principle of the United States” from the book “Moral Ground”, ASU’s president, Michael Crow, discusses the individual and collective moral responsibilities for sustaining our planet. Arizona State University is one of the best places globally to conduct use-inspired, transdisciplinary research. The university’s Sustainability Scientists, Scholars and Fellows represent a tremendous breadth of academic disciplines from across ASU and beyond. 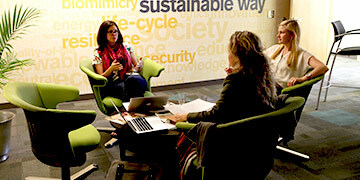 Together, they are accelerating the pace of discovery and understanding in the field of sustainability. This video was presented at the second annual meeting of Sustainability Scientists and Scholars, held at ASU September 17, 2015. ASU launched the Sustainability Scientists and Scholars program with the goal of ensuring sustainability is an outcome of our collective, creative, scientific and scholarly and teaching activities. We want to produce creative people, innovative ideas, new, transdisciplinary concepts, theories and technologies that will positively impact society and the planet.